The present work is motivated by the study of creep in granular materials at the microscopic scale. The first part of this thesis deals with displacement measurements by microtomography. Classical digital image correlation fails to catch time-dependent (possibly fast) phenomena such as short-term creep. A new method named Discrete Digital Projection Correlation is developed to overcome this limitation. This method requires very few projections (about 100 times less than classical methods) of the deformed state to perform the correlation and retrieve grain displacements. Therefore, the acqui- sition time is remarkably reduced, which allows to study time-dependent phenomena. The method is tested on experimental data. While its accuracy compares favorably to that of conventional methods, it only requires acquisition times of a few minutes. The origins of measurement errors are tracked by numerical means, on simulated grain displacements and rotations. 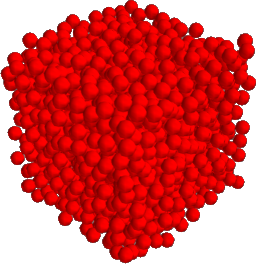 The second part is a numerical simulation study, by the Discrete Element Method (DEM), of oedometric compression in model granular materials, carried out with a simple model material: as- semblies of slightly polydisperse spherical beads interacting by Hertz-Mindlin contact elasticity and Coulomb friction. A wide variety of initial states are subject to compression, differing in density, coordination number and fabric anisotropy. Despite apparently almost reversible strains, oedometric compression proves an essentially anelastic and irreversible process, due to friction, with important internal state changes affecting coordination number and anisotropy. 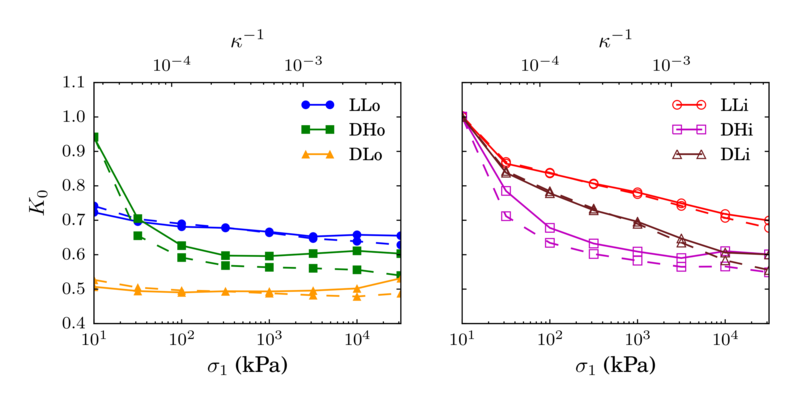 Elastic moduli only describe the response to very small stress increments about well equilibrated configurations. The ratio of hori- zontal stress to vertical stress (or coefficient of earth pressure at rest, commonly investigated in soil mechanics) only remains constant for initially anisotropic assemblies. A simple formula relates it to force and fabric anisotropy parameters, while elastic moduli are mainly sensitive to the latter. Fur- ther studies of contact network instabilities and rearrangements should pave the way to numerical investigations of creep behavior. 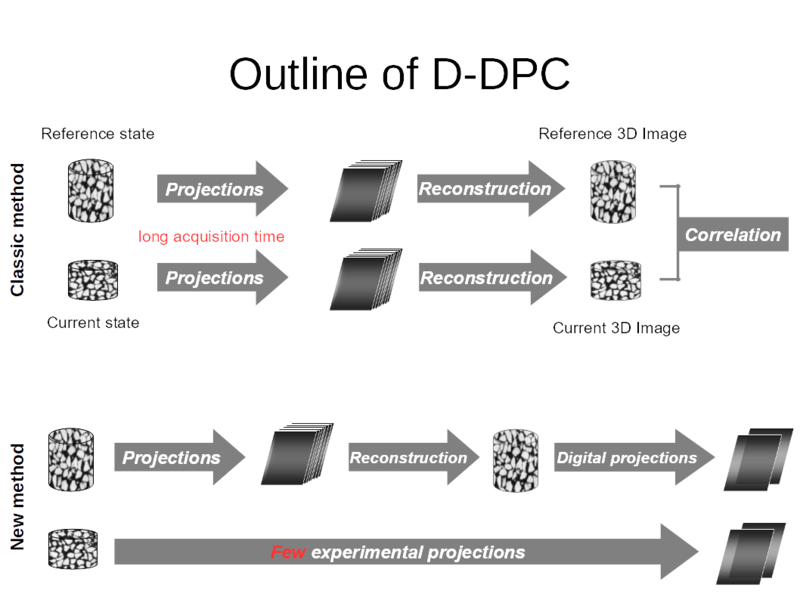 Keywords: Digital Image Correlation, Discrete Element Method, X-ray tomography, granular materials, full-field measurements, oedometric compression, elastic moduli, creep. This work was co-funded by MMCD and IFSTTAR. M.H. 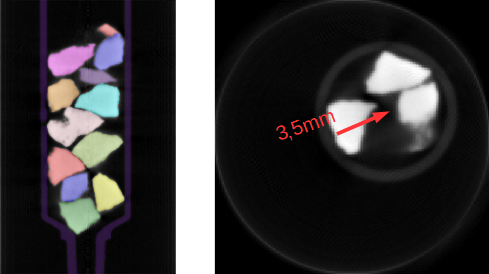 Khalili (2016), Measuring grain displacements from X-ray tomography projections: a time-saving method, Imaging of Construction Materials and Geomaterials, 7-8 July 2016, Champs sur Marne, France. Khalili, M.H., Brisard, S., Bornert, M., Pereira, J-M. and Roux, J-N., (2016), Une nouvelle méthode pour mesurer les mouvements des grains dans un milieu granulaire par micro-tomographie à rayons X, Techniques d’Imagerie pour la Caractérisation des Matériaux et des Structures du Génie Civil – Journées Thématiques, mars 2016, Grenoble, France. Khalili, M.H., Brisard, S., Bornert, M., Pereira, J-M., Vandamme, M. and Roux, J-N., (2015), A new method for measuring grain displacements in granular materials by X-ray computed tomography, 2nd International Conference on Tomography of Materials and Structures (ICTMS 2015), Jun 2015, Quebec city, Canada. HAL Id: hal-01194699. Khalili, M.H., Roux, J-N., Pereira, J-M., Vandamme, M., Brisard, S., and Bornert, M., (2015), Internal states, stress-strain behavior and elasticity in oedometrically compressed model granular materials, Particles 2015, Sep 2015, Barcelona, Spain. IV International Conference on Particle-based Methods – Fundamentals and Applications. HAL Id: hal-01214733. Khalili, M.H., Brisard, S., Bornert, M., Pereira, J-M., Vandamme, M. and Roux, J-N., (2014), New method for measuring grains displacement in granular materials by X-ray computed tomography, Modeling Granular Media Across Scales, Jul 2014, Montpellier, France. HAL Id: hal-01137696.